“During the last hurricane, I was doing everything I’d heard suggested, including filling my deep, old, clawfoot tub with water. 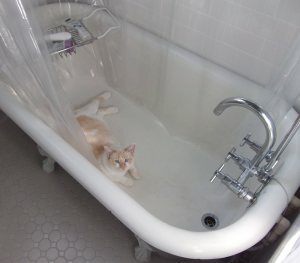 I completely forgot about Django, my cat, who likes to nap in the tub. We understand that Django has recovered from his shock and is back to napping in the tub.